Come alongside us as we follow the Rooted crew venturing through a typical day on the farm. 8:50am- Arrive at the farm, say hello to the farm cats, catch up with coworkers. 9am- Welcome message in the Rooted HQ. Go over the day’s schedule, hear program announcements, fill up water bottles and apply sunscreen. Get ready to be outside! 9:15am- Today, we are joined by a member of the Farm Team, who will introduce us to a new sustainable agriculture topic. 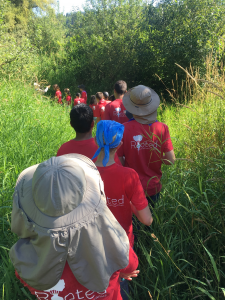 We walked through the garden and down to the banks of the Snoqualmie River and to talk about irrigation and water rights. 9:45am- Start field work. Tasks are assigned and we settle in and get to work. Today, we are harvesting zucchini, potatoes, and cabbage- and because we are done so fast, we started weeding the pumpkin patch. Field work is our favorite time of the day; nothing feels better than bringing in carts full of produce that we just picked fresh from the garden. We weigh our produce, clean and package it, and send it off to feed our community. Another hard day’s work accomplished! 12:30pm- Team building activity. We do many activities throughout the summer to get to know each other better and work on our teamwork skills. 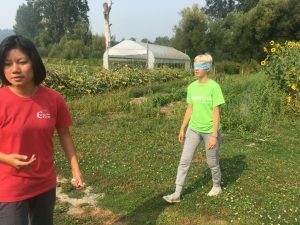 Today, we are leading a partner through the garden blindfolded- it’s a great way to work on our communication skills! 1pm- Food Systems workshop. Today, we are learning about the process of growing corn and the journey it takes as it’s made into breakfast cereal. We are surprised at all of the stops it makes and how many people are involved in transforming it from the corn we work with on the farm into the cereal in the grocery store. 2pm- Quick break to gather eggs from the chicken coop! We gather them every day, twice a day. 2:30pm- Sustainable Agriculture workshop. Today we are learning about the differences between sustainable and conventional agriculture. There are many aspects that influence how a farmer decides to grow their food- we review various scenarios and determine the ways that we would choose to grow food if we owned our own farm. 3:30pm- We gather to talk about our work at the food bank tomorrow, take any extra vegetables home, and talk about recipe ideas for our culinary class this week. I joined ‘Rooted’ to make my summer meaningful. I didn’t want to be trapped in my house watching TV every day, I wanted to go outside and soak up the sun. When I saw the flyer for this job, I immediately put in an application. Not only would I get to be outside, but I would get paid for it. In addition to soaking up the sun, I would also get educated on farm life. Farming has always been an interest of mine. I knew from the first home-grown tomato I tasted when I was a little girl that I wanted to learn how to grow and harvest food. ‘Rooted’ offered everything I was looking for this summer. Now in my last week, I can tell you that’s it has definitely been worthwhile. I am especially thankful for the hands-on farm experience, the wonderful people I have met, and the path that this job has put me on. There was never any better way to know if I liked farming then to just become a farmer. No textbook could teach me how to properly harvest garlic or what the peak ripeness of a marionberry was. I learned so much about planting, weeding, pruning, harvesting, irrigation, bees, chickens, etc. I felt like I grew so much in my knowledge and appreciation of farming over the course of the summer, just like the sunflowers we were able to watch- going from tiny seedlings to towering giants in just a few weeks. Fieldwork time always flew by, in part because I got to hear about the lives of my fellow ‘Rooted’ colleagues. Getting to know them was one of the very best parts of this job, and I ended up leaving with life-long friends. I especially enjoyed getting to cook with them. Each time we cooked we were teamed up in different groups. Cooking with others creates such a magical bond and throughout the summer we were able to strengthen that bond with everyone in the program. Reflecting on these last seven weeks and all the friends I’ve made gets me emotional, just knowing that I will not get to see them every day anymore. Not only did we become friends, we became family. In addition to learning about farming and making friends, this program has also put me on a new path. I now hope to pursue a job in the environmental or agricultural field in the future. I’m also planning to continue to work part-time at Carnation Farms throughout the year. This experience is just the beginning for me. ‘Rooted’ has definitely been one of the greatest adventures of my life thus far, and I’d like to thank everyone who made it possible! I am beyond grateful to have been given this opportunity and am so excited to see what the future holds! My Impact Project is about pollinators in our environment. Pollinators make up the base of our food system, and without them, we wouldn’t have a lot of our produce. I was inspired to pursue this project because of the way people tend to think about insects. Bugs tend to be thought of as gross or scary, but they are actually a vital to our world. I want to help change the way people think about insects and their role in our ecosystem. For my Impact Project I am making chocolates with all organic ingredients. I was inspired by the mint growing here on the farm. I originally wanted to make a mint extract, but then I thought that it would be amazing to mix the mint with chocolate. I really like candy and baking and I took a chocolate-making class last year in school, so I wanted to try to combine the mint from the farm with the chocolates that I learned to make last year. I found out about ‘Rooted at Carnation Farms’ through my Mom. Reading through the job description it sounded like a perfect fit for me. I was even more excited after the interview, and waited anxiously to hear back. After two weeks of waiting, I got the call that I had got the job! I was so happy, I felt like I had just won a thousand dollars. 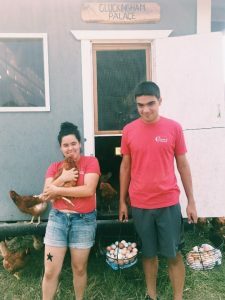 The thought of working on a farm, learning more about sustainable agriculture, working at the food bank, working at farmers markets, and one of the best things, making new friends, all sounded like a dream job. Working here has been one of the best experiences of my life. We are learning so many things during our time at ‘Rooted’. We’re getting hands-on training in sustainable farming, food systems, nutrition, food justice, and my personal favorite, culinary! Every Wednesday we have a culinary session with chefs Tracy and Tiffany. Each session we learn cooking techniques and a new dish that we can re-create at home. The first week we made pizza and learned how to handle a knife safely and effectively. The second week was especially hot and we learned how to make vanilla ice cream and red currant sorbet. The third week we made walnut crusted chicken with a raspberry vinaigrette dressing. The fourth week we made lasagna that went to a soup kitchen in North Bend for distribution. This past week was probably my favorite week as we practiced reading recipes and measuring by making energy balls. It took about ten minutes to make the recipe and they were super delicious and healthy. One aspect of our culinary sessions that I like in particular is that we cook with the vegetables that we harvest ourselves. I’ve really been surprised by the difference between using vegetables straight from the farm and the produce that comes from a grocery store. You can really taste the difference in fresh fruit and vegetables. The culinary aspect of ‘Rooted’ is especially important to me because I help cook for my family. I’m also the oldest still living in my house and really, the only one that loves to cook. My mom depends on me to make dinner multiple times a week as well as meals for guests and on special occasions. Learning from the chefs at Carnation Farms has been really valuable. Although I am familiar with many of the techniques they are teaching us it is been great to be able to get more practice and hone my skills. One skill that is new to me is cooking as part of a team. Whenever I cook at home I am always cooking by myself. I’m able to cook things the way I like it, making it up as I go, usually not following a recipe. However, at Carnation Farms we cook in groups. Cooking with others has been stretching me outside my comfort zone. Rather than taking over and doing it all myself I am having to stop and listen and work with others. Cooking in a group is teaching me how to work with different people and how be comfortable with it, a skill that will helpful throughout all aspects of my life. Being in ‘Rooted’ is a once in a life time experience and I am so grateful to be a part of it. Besides working on my farmer’s tan, I joined ‘Rooted’ to gain experience working with others. I was excited by the idea of working with 20 other kids on a farm all summer. I was also interested in learning the ins and outs of running a local, organic farm. Before this summer, my only experience with gardening had been helping my dad with his pumpkin patch each year. My dad grows giant pumpkins that he enters into contests at fairs around the state. In addition to pumpkin growing, I’ve also been learning about soil and photosynthesis in biology class this past year. At ‘Rooted’ we spend most of our mornings working out in the farm. Our afternoons are spent in workshops where we learn more about the food system and sustainable agriculture. We also have culinary sessions where we learn to prepare the fruits and vegetables we harvest. My favorite workshop so far has been one that focused on our food system. The workshop was led by Martha, who is a dietitian and the Director of Education here at the farm. In this workshop we learned about the ingredients that could be hiding in processed foods. For example, I learned that McDonald’s french fries have a hidden ingredient. I had just assumed that the fries were made of potatoes, but we learned that they contain a special ingredient called “beef flavor” that is actually made from wheat and milk. For someone like me who is wheat-free, I had no idea that wheat could be hiding in a french fry. In addition to becoming more aware of processed foods, I have also learned more about the nutrients my body needs each day. For example, a full-grown person like me needs to eat at least 4 cups of vegetables each day in order to hit the US’s recommended veggie intake. That is way more vegetables than I am currently eating! I am now keeping that in mind as I pack my lunches for work and as I eat my dinner each night. 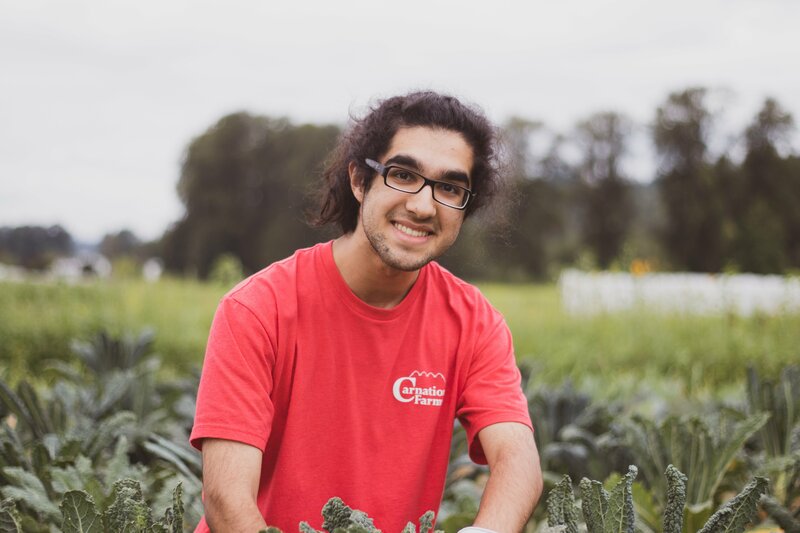 Working at Carnation Farms has definitely given me a greater appreciation for where my food comes from and has challenged me to think of ways that I can contribute to our food system. One way is through food policy. Recently we’ve been learning about how policy impacts agriculture, especially the rules around organic farming. This information and insight has given me the confidence to find way to get involved to help advocate for farmer needs. Above all, I’ve learned that farming is hard work. With a limited growing season and lots of challenging factors it can be really hard to turn a profit. To do so you really have to pay attention to everything, like planting, irrigation, weather, soil health, and harvesting timelines. I’ve already learned so much and am excited to keep learning more throughout the rest of my time in ‘Rooted’! This question really struck a chord with me, what did I want? I realized that I what I really wanted was to be outside. I wanted an escape from the schoolwork or from the city, the whole routine of unfriendly faces and the grey highway strip. I wanted to work hard, to get dirty, and to end the day with sore muscles, ready for bed. That’s how I ended up at Carnation Farms in the ‘Rooted’ program. It’s not exactly how I imagined it; the work isn’t as grueling as I thought it would be and the dirt isn’t that “dirty”. I spend my day learning about plants, even the ones I thought I knew a lot about. There is so much I was in the dark about in terms of the food system. So much changes in the journey from farm to table that I wasn’t aware of. I’ve learned that land has to be worked (and nurtured) not broken down. I’ve also learned that everything on the farm has a certain relationship that needs to be maintained. When I think of a farm now, a very different picture comes to mind now that I have experience with Rooted. I am also learning that people’s relationship with food is very different from person to person. Some eat on a diet or by the clock, while others eat whatever is in the fridge or what’s affordable to them. Once a week at Rooted, we volunteer at a local food bank. My team works at the Snoqualmie Valley Food Bank in North Bend. I have learned that the food bank is the lifeline for certain communities and holds a lot of responsibility to provide food to its clients. When time and money is thin, people still deserve the right to choose what they get to eat. At the food bank, they have to provide what people want, but also what they need. Sometimes, what happens to be affordable isn’t always good for long-term health, and I have been proud to see that our local food banks stock a lot of healthy food options. I have volunteered at many food banks, and while the work isn’t always the most glamorous, it is a great feeling you get when you can count all of the pounds we helped raise from a food drive, or finish hauling and sorting large pallets of rice. Even the work we do on the farm at Rooted affects how much selection is offered to clients at the food bank, because a portion of the vegetables we harvest are brought with us to donate every week. I have enjoyed being a part of the entire process, from farm to the table, because it’s rewarding and insightful. Why did you join ‘Rooted’? Asking around the room will get you a number of different – and similar – answers from the 20 of us kids in ‘Rooted’. Mine is similar to some in that I’ve been looking to fetch a first job now that I’m at the right age, not to mention that many of my own friends have picked up jobs themselves. More specifically, however, I’d hoped to work at ‘Rooted’ because of the garden my parents have been putting together. Up until now, I’ve only really had the brain to help them out by shoveling and carting around gravel and soil, but the skills and knowledge I’ve gained here at ‘Rooted’ I’m able to apply at home and help give back to my family. Each day starts with fieldwork. Once we know what jobs we need to do, we split into groups and, unless we have some training to do first, we get started. The time we spend on fieldwork can be divided into four different jobs: weeding, harvesting, planting, and ‘dish’ washing. The more common of the four are weeding and harvesting, which have been fairly self-explanatory; although, there are often times when we need a little training in order to be able to harvest a crop in an un-damaged, sellable fashion or guidelines to keep in mind so that we don’t do more harm than good while weeding around a plant. Planting and ‘dish’ washing jobs happen a little less frequently, at least so far. Last week we lined up and powered our way through planting quite a few rows of basil varieties. ‘Dish’ washing has started to ramp up in the past few days. We have to clean our containers that we use to hold the berries we pick and the zucchini we cut (not actual dishes). When on ‘dish’ duty a team of about five divides up across three stations that power wash, scrub, and finally rinse out used tubs, knives, and baskets. What do you like (or not like) about fieldwork? Personally, there’s really nothing that I don’t like about fieldwork. Everyone approaches it a little differently: some people find their area of work and have little chats while they’re pulling up roots, others (like myself) find their place to work and settle in, nice and quiet. I find myself just taking some time to think while I do my field work, to really take in the motions and rhythm of what I’m doing. I believe Kaila, another ‘Rooted’ member, best described it when she called it therapeutic. Some of the jobs, like berry picking or singling out the more meticulous weeds, can get workers into ‘the zone’, a place of just absolute focus. Once they come out of it, I usually hear them express great satisfaction in the sight of a fruit or veggie-filled basket. What’s it like to harvest vegetables to give to the food bank? It’s tough to describe. The job is gratifying on its own, so the thought that my work helps others makes it really special. It’s a reminder that none of the work we’ve been doing has gone to waste. This job really covers all bases by giving us firsthand farm experience, educating us on food systems, and giving us a chance to help more than ourselves by doing things like taking food to the food bank, all of which makes me really glad to be a part of ‘Rooted’. 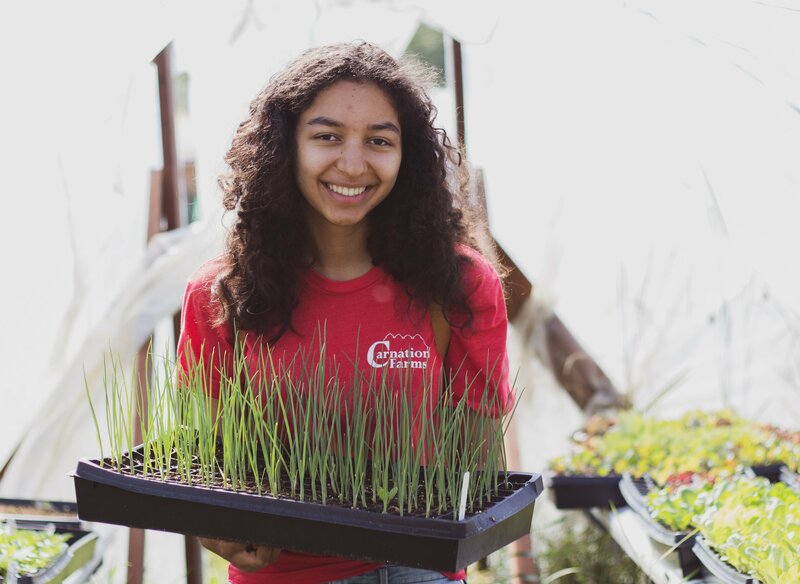 My name is Jessica, and I am a member of the 2018 Rooted Seed Crew at Carnation Farms. 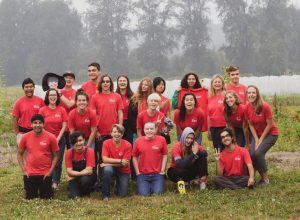 Rooted is a 7-week long program for young people, ages 14-17, to learn about food systems through daily workshops, volunteering at food banks, and working on the farm. As we wrap up this first week, I’ve taken a moment to reflect on why this program makes me so excited, and why I was so passionate to join. I’ve always admired nature’s ability to create flawless systems, and humans’ ability to take advantage of and optimize those systems. This program combines fresh food, hard work, sunshine, and a whole lot of knowledge into a very cohesive seven weeks. 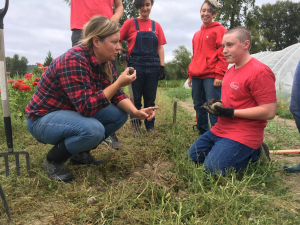 Throughout this time period, we’ll be learning about plants, animals, soils, conservation, pollinators, predators, pests, and much other necessary information to work on a farm. In a world where basic entry-level jobs are abundant, this specific job is a dream to me because of where I get to be, what I get to learn, and the impact I’ll be able to make. Making a difference in this world is very important to me, even if the difference is small. The most valuable things I’ll take away from this are the things I’ll learn. Not only will I be able to change my own behaviors to better myself and the planet, but I’ll get to pass that knowledge to my family and friends, the people I love the most. And I hope, with a little help, they will all have a better understanding of and stronger relationship with the food they eat, and that my children and grandchildren will have the same appreciation for the natural world as I do. A hearty welcome to our 20 enthusiastic youth who will hold jobs at Carnation Farms this summer! Rooted launches July 9 with our Seed Crew working on the farm growing and harvesting produce and tending chickens and other livestock. They will also participate in workshops to learn about sustainable agriculture, food systems, and healthy cooking. 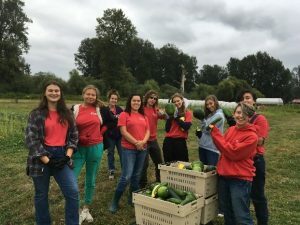 Through weekly work parties at food banks in Carnation and North Bend, our Seed Crew will see the impact of hunger in our community and gain first-hand understanding about ways to help, including donating fresh nutritious vegetables from our farm. We recently held an orientation for youth and their families, and the room was alive with energy as our 14- to 17-year-old workers turned in paperwork to become employees of the farm. For many, this is their first job, and what rewarding work it will be! 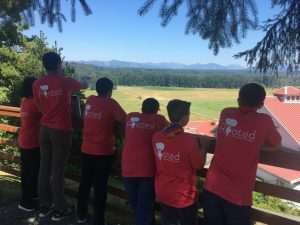 Over the 7-week employment and education program, they will grow in their leadership skills and bond with other youth from the Snoqualmie Valley and beyond. By the end of the summer, these skilled young people will be well on their way to becoming knowledgeable and engaged food citizens. Check back here to read posts from our amazing Rooted Seed Crew workers! Throughout the summer, we will be hearing from them in their own voices about their experiences at Carnation Farms.